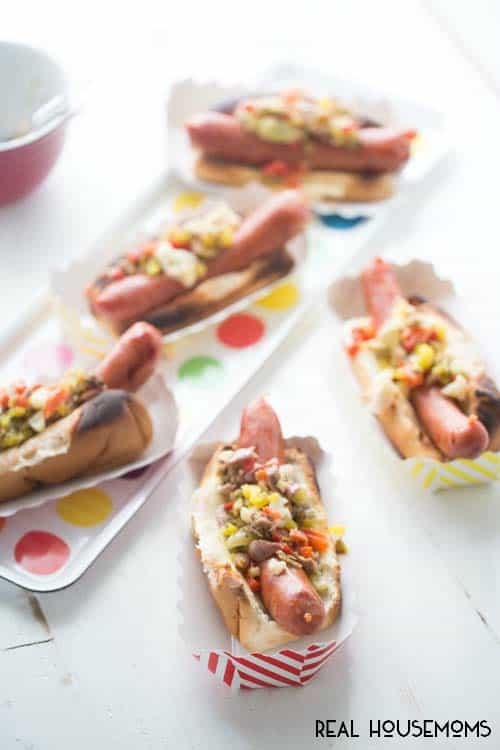 This Muffaletta Hot Dog is a great way to spruce up a BBQ staple! 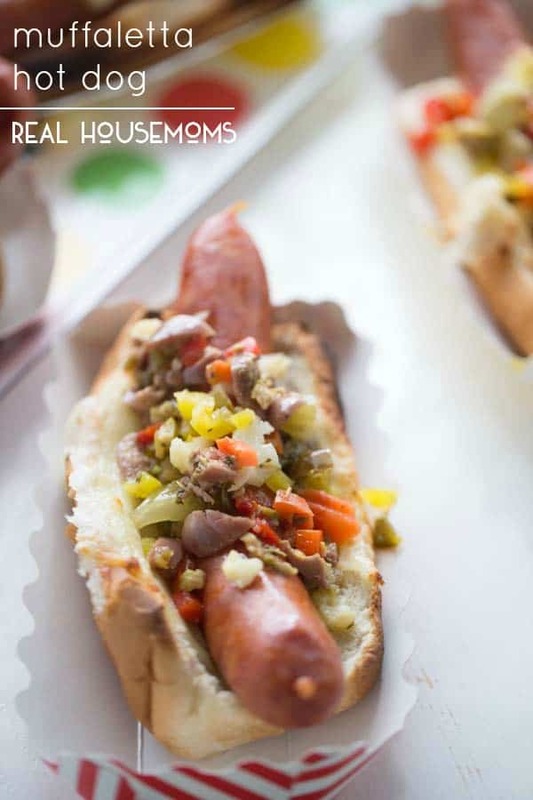 Today I am sharing a super fun hot dog recipe with you. This is no ordinary “dog” however, this is andouille sausage. Andouille is probably my favorite sausage. It’s full of flavor with a bit of spice. It’s a Creole favorite as are muffaletta sandwiches. I was in my early 20’s the first time I tried a muffaletta sandwich. I used to frequent a bread baking facility that opened up a rudimentary restaurant. At the time, their menu was sparse, regardless, whatever they served was delicious! This is where I stepped out of my comfort zone and tried a muffaletta sandwich! I’ve been smitten ever since. In fact, that sandwich is the inspiration behind this pizza and this dip. The olive salad is key to this recipe. I used pimentos, giardiniera, pepperoncini peppers, black olives and green olives. A little oregano, olive oil and red wine vinegar rounds it out. I melted provolone cheese in each of my hot dog buns, rested my sausage on top of the gooey melted cheese and spooned my olive salad right on top. 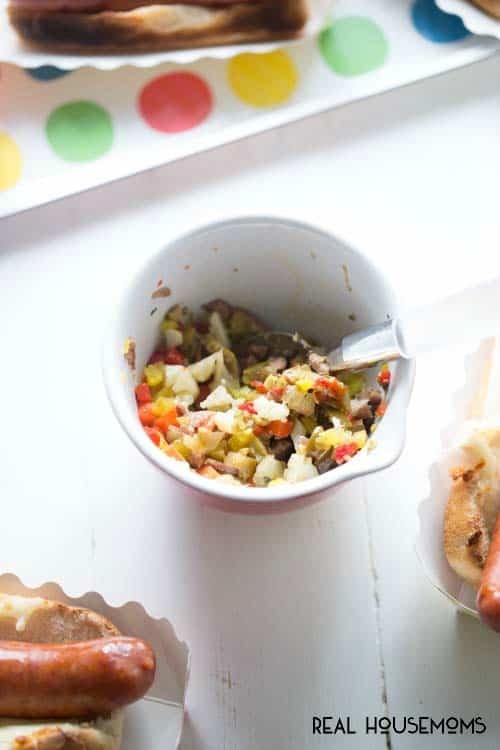 This muffaletta hot dog is tangy, spicy and cheesy all at the same time! In a bowl, combine, pimentos, giardinara, pepperoncini, olives, olive oil, vinegar, oregano and salt, stirring to combine. Set aside. Grill sausage links 5-7 minutes, or until cooked through. Place cheese slices in each bun and top each with sausage link. 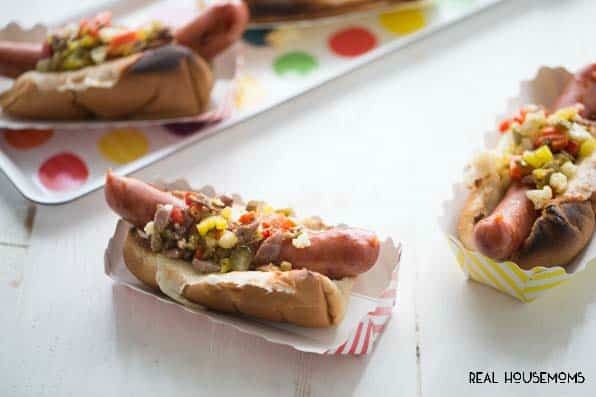 Place hot dogs on a baking sheet and broil for 1-2 minutes or until cheese has melted. Remove from oven and top with olive salad; serve.